Freehold development, One Surin is nestled in a tranquil landed enclave along Surin Avenue. Situated between the Kovan and Serangoon estate, this beautiful resort-like development is only a short distance to both Kovan and Serangoon MRT station. Moving slightly farther down, there are Bartley MRT station and Lorong Chuang MRT station, the accessible location of One Surin allows several MRT stations to be within easy reach to residents who need to travel to any part of Singapore. Comprising of 27 terrace houses, each terrace house in One Surin consist of four spacious bedrooms and a study room. 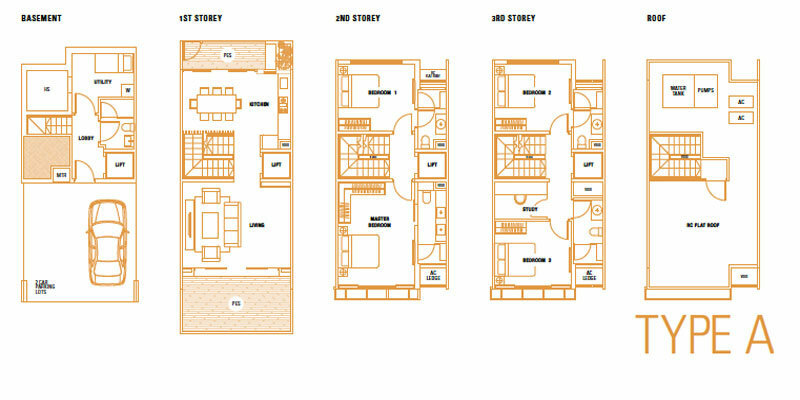 The sizes of the cluster houses range from 3,681 sqft to 5,264 sqft with some units having a sunken spa within. All units come with private car porch consisting of two exclusive carpark lots. Upon entry to One Surin, be greeted by the sophisticated waterscape and lush greeneries that filled most of the communal areas of the development. Other than the lap pool, facilities such as Barbecue Pavilion, Outdoor Exercise Area, Medication Deck, etc can also be found within the development. Freehold residential development, One Surin is estimated to be obtaining its TOP by end of 2016. Register your interest with us today for an exclusive viewing of the actual unit today. Our unit starts from S$2.66 mil onwards. Contact us @ +65 9137 4668 / +65 9137 4669 for Direct Developer Price now.